The Harbours at Solomons Island is a 55+ community in Dowell, Maryland. The Harbours at Solomons Island is the only waterside active adult community that offers a prime location for boating enthusiasts. The Harbours at Solomons Island will feature resort-style amenities and a private marina in an attractive seaside setting. Homebuyers can choose from elegant carriage and single-family home designs from Classic Group that appeal to active adults. Located in Dowell, Maryland, The Harbours at Solomons is just 60 miles from the Capital Beltway and Annapolis. Residents will be close to beaches, docks, boats, and plenty of parks to enjoy the outdoors just steps away from their backyard. Plans for a resort-style clubhouse are currently in progress. The proposed clubhouse will feature two on-site waterfront restaurants, a state-of-the-art fitness center, billiards room, business center, library, and multi-purpose room. Outdoor amenities are to include a pool, tennis courts, marina, boat slips, kayak launch, beach area, neighborhood parks, scenic lakes, and walking and biking trails. One of the best amenities in the community will be easy access to waterways for boating and fishing activities. Construction of The Harbours at Solomons Island began in 2015 by trusted builder Classic Group. Upon completion, the community will consist of 252 residences. Homebuyers can choose from two home designs: carriage homes and single-family homes. Carriage homes are attached residences that offer approximately 1,800 square feet of living space. They have two bedrooms, two or three bathrooms, and a two-car garage. These homes feature spacious patios, open floor plans, and plenty of space in an unfinished basement that's perfect for personalization. Homebuyers can choose from spacious single-family home designs as well. These floor plans offer 1,894 to 2,308 square feet of living space with two or three bedrooms, two or three bathrooms, and two-car garages. Single-family homes feature master suites on the main floor, unfinished basements, and the Skipjack model offers second-floor bedrooms and a loft. The Harbours at Solomons Island will provide plenty of social activities and events for all residents to enjoy. They will be able to get together at the clubhouse, spend time at the beach, walk along the docks, go kayaking or fishing, or take their boat out to cruise down the river. Residents will also enjoy tennis courts, community parties, and other social events. As the community continues to grow with new neighbors, more events and clubs will become available for homeowners. Ideally situated in Dowell, Maryland, The Harbours at Solomons Island is the perfect seaside active adult community. Residents enjoy no traffic from Bay Bridge and are just 60 miles from the Capital Beltway and Annapolis that are great for entertainment and attractions. The area is also near many museums for a dose of arts and culture like Calvert Marine Museum, Smithsonian’s Annmarie Gardens, and Solomons Island Winery. Homeowners are also close to shopping, dining, festivals, parks, and nightlife establishments. For big-city attractions or when traveling farther is required, Baltimore and its international airport is just under two hours away. 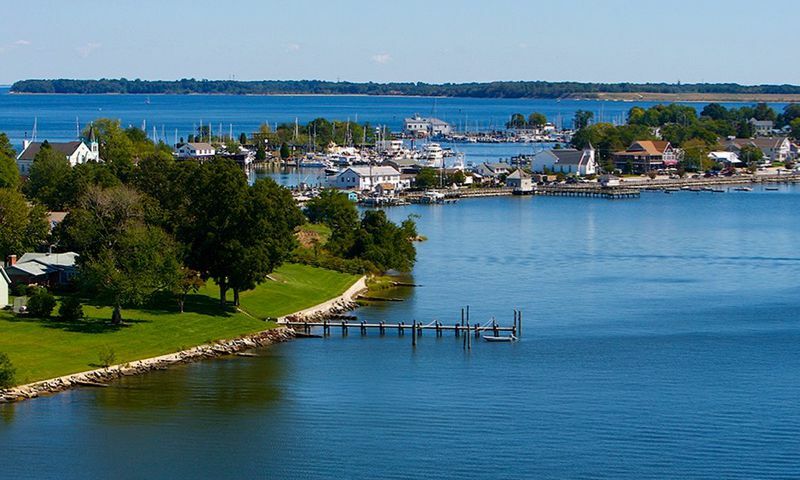 The Harbours at Solomons Island is a charming 55+ seaside community in Calvert County, Maryland. Check back soon for more information on the lifestyle in The Harbours at Solomons Island. Carriage homes are attached residences that offer approximately 1,800 square feet of living space. They have two bedrooms, two or three bathrooms, and a two-car garage. These homes feature spacious patios, open floor plans, and plenty of space in the unfinished basement that's perfect for customizing to your style. Homebuyers can choose from spacious single-family home designs. These floor plans offer 1,894 to 2,308 square feet of living space with two or three bedrooms, two or three bathrooms, and two-car garages. Single-family homes feature master suites on the main floor, unfinished basements, and the Skipjack model offers second-floor bedrooms and a loft. 55places.com is not affiliated with the developer(s) or homeowners association of The Harbours at Solomons Island. The information you submit is distributed to a 55places.com Partner Agent, who is a licensed real estate agent. The information regarding The Harbours at Solomons Island has not been verified or approved by the developer or homeowners association. Please verify all information prior to purchasing. 55places.com is not responsible for any errors regarding the information displayed on this website.